Rose (Toni Collette) tracks down Maggie (Cameron Diaz) at their grandmother's place. Rose (Toni Collette) finds out that Maggie has vanished from the surface. Maggie (Cameron Diaz) and Rose (Toni Collette) deal with resumes and shoes. Press junket interview with Toni Collette to promote the theatrical release of "In Her Shoes" in the United States. Excerpt from the making of "In Her Shoes", including interviews with Curtis Hanson, Cameron Diaz and Toni Collette. 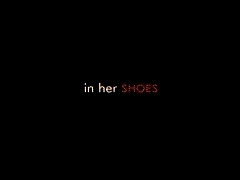 Theatrical trailer for "In Her Shoes", directed by Curtis Hanson and starring Cameron Diaz and Toni Collette. November 06, 2005. Cameron Diaz and Toni Collette promote "In Her Shoes" in Germany. November 05, 2005. Cameron Diaz and Toni Collette promote "In Her Shoes" in Germany. October 2005. Cameron Diaz and Toni Collette promote In Her Shoes on the British edition of MTV TRL. October 04, 2005. Cameron Diaz and Toni Collette talk about "In Her Shoes". October 2005. Cameron Diaz and Toni Collette promote In Her Shoes on the Australian programme "Today"
September 28, 2005. Cameron Diaz, Toni Collette, Curtis Hanson and Mark Feuerstein are interviewed at the Los Angeles premiere of "In Her Shoes".